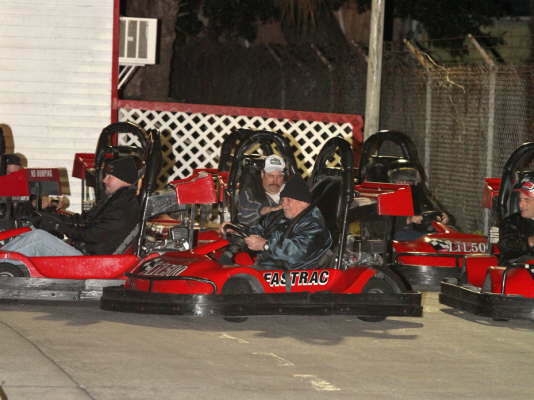 In the middle of winter, there is no real racing going on, so we throw down at the Little 500 kart track. This years edition was the biggest yet. 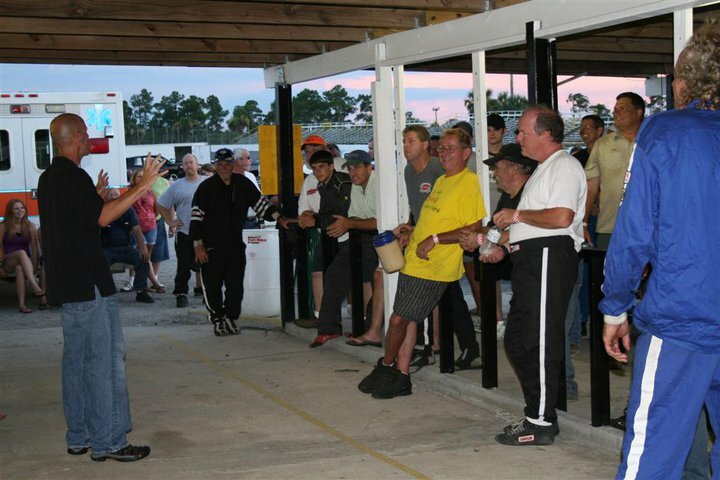 There were hundreds of racers, crew, fans, officials and even a pair of track owners! Once again, I easily pass my arch rival Michael Seay. Synchronized spins! 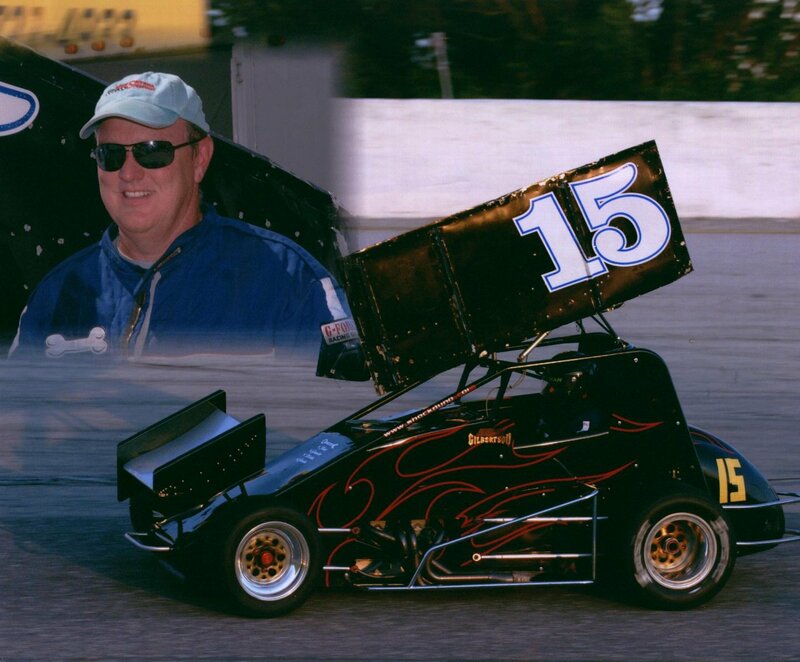 Mike Peters, owner of Ocala Speedway, and Modified driver Jim Higgenbotthem, lose it at the same time and manage to block nearly the entire track. Florida Flag Stand owner Craig Stern look on in disbelief. Tim Walters attempts to steal my winnings. We had a great night with lots of good friends! 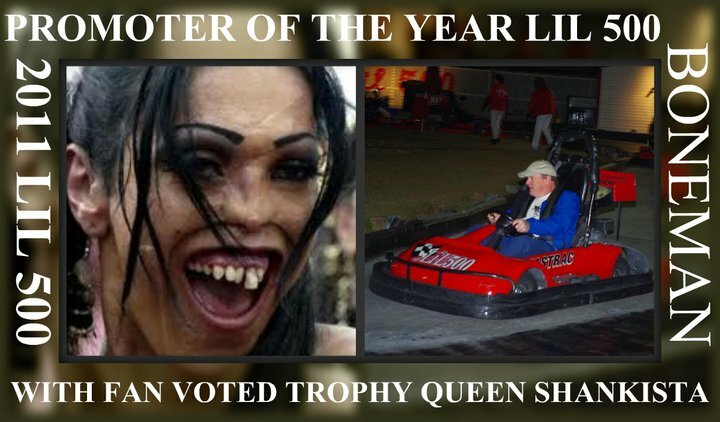 This years trophy queen was the lovely Skankeshia. 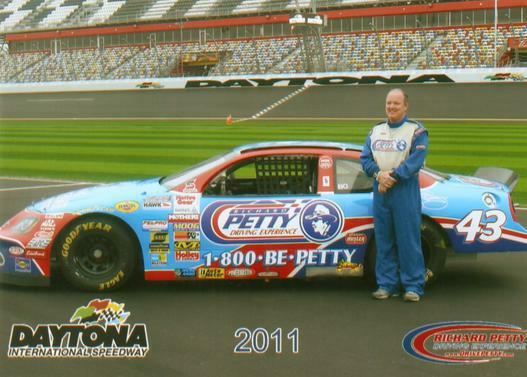 I received a certificate for 16 laps, so I gave it a go at Daytona. Although we had to follow a pace car, I also never had the chance to go 155 MPH before. But at Daytona, the car is capable of much faster, and although the driver was willing, it just wasn't allowed. It was fun, try it! I made my first dirt track start in many years tonight in the Gladiator division. The surface was really rough tonight, but that is just part of dirt racing. In the end, I ended up 6'th out of 14 cars. A night to forget! I had a new engine in my mini stock, but it broke after 15 laps. That was my first engine failure in 9 years. Oh well, at least the new numbers are intact. This is more like it, I had a great night in the Strictly Stock. I ended up 4'th out of 21 cars. The picture above left is 2'nd, 3'rd and my car crossing under the checkered. Here is link to an in-car video shot from another car in my two races. Thanks to Luis Guillen for the video! Grrr.... My mini stock wasn't ready, so I put mini stock tires on the Strictly Stock and did a Cup quality "start and park". I ended up 5'th. This night takes a little explaining. 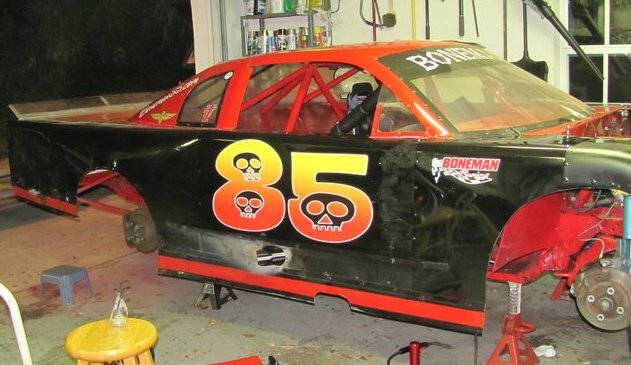 I had a new engine in 85, so I ran a few laps of practice. Then I was told that the announcer was injured and could not attend, and was asked to fill-in. How bad could it be? I said sure, and became the "undocumented, instant announcer" for the evening. I called Andy to drive the mini stock. His job was to take it easy for a few laps and pull in. Andy executed his fill in driver responsibility perfectly, and I managed to fake my way through the night in the announcer's chair. I took the strictly stock out, and had a pretty destructive night. I ran third in the heat, but the feature was a disaster. There was crash after crash, and a bunch of drivers who just wanted to tear things up. I got sent to the rear of the field twice, but was passing second place when that car spun out and caved in my left front corner. I get in incidents at and 5:15 and 12:10. 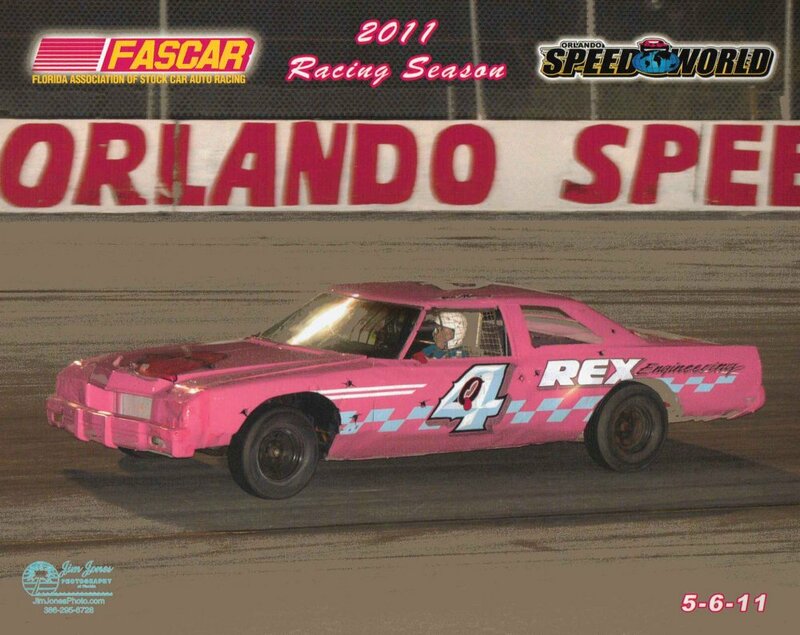 The pink car is Ron McCreary in his Rex Engineering Buick Electra! 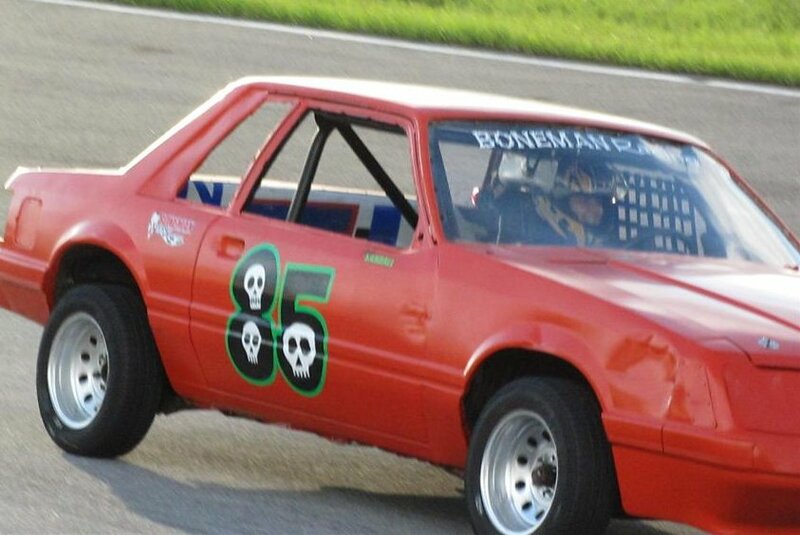 I had the mini stock in the pits, but a monsoon with hail and high winds moved in and rained out the races. Todd McCreary was in town, so we ended up at Little 500 with a dozen or so people from the track. Fun! 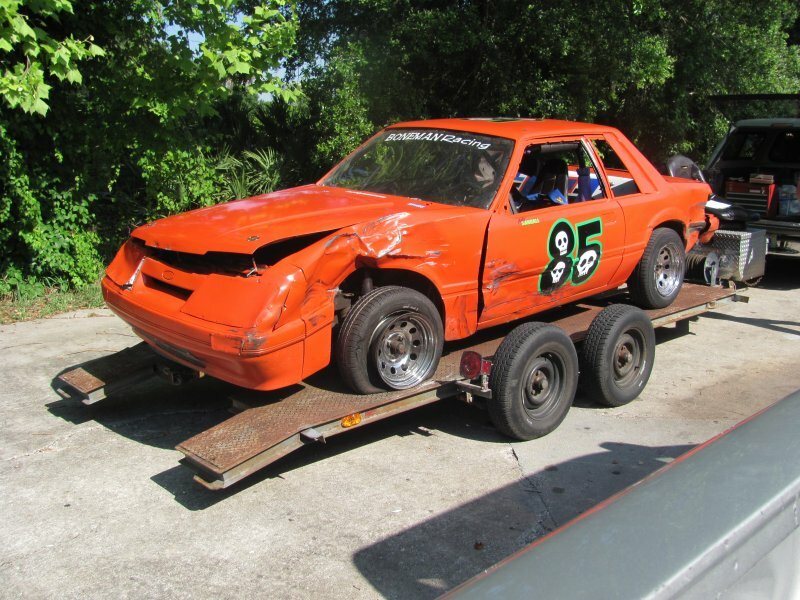 I ran the strictly stock and finished 4'th. Mini stock night at NSS. This was my first time there with this car for 1 1/2 years. I had a very uneventful race and finished 5'th. I had a long and hot day at Citrus! Christian won a heat race and Steven won the feature for the 4'th time. Scratch one off the bucket list! 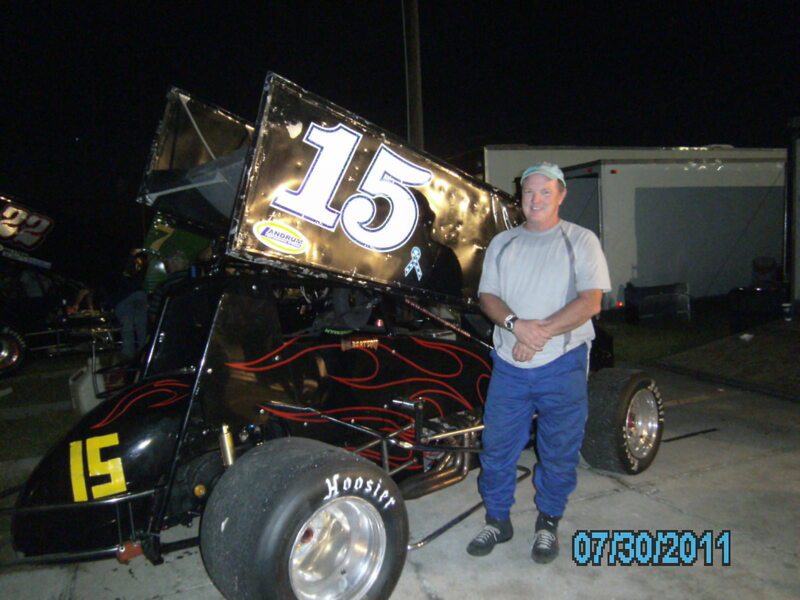 I've always wanted to race a sprint car, so I rented this TBARA and climbed in at De Soto Speedway on 7-30-11. I loved it! 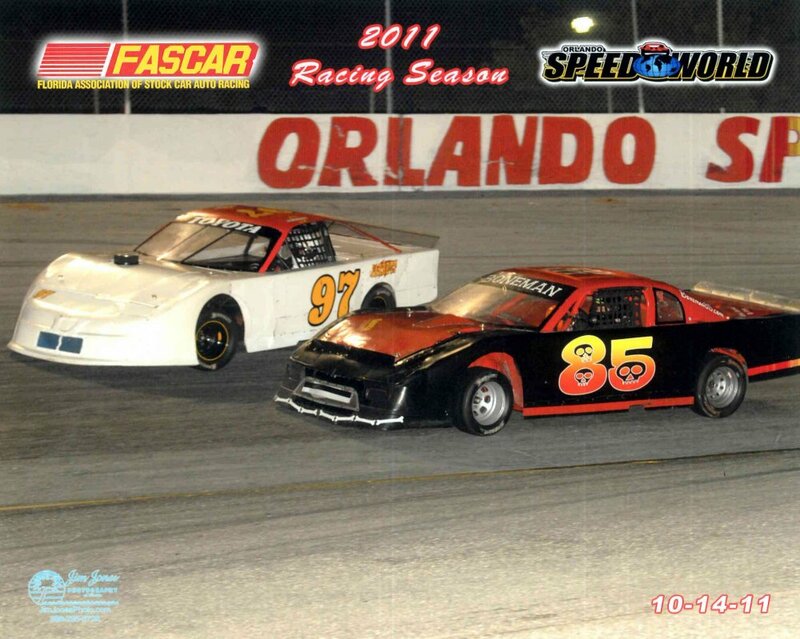 I had two practice sessions and a heat race. Then after a really good day, things went pretty bad. 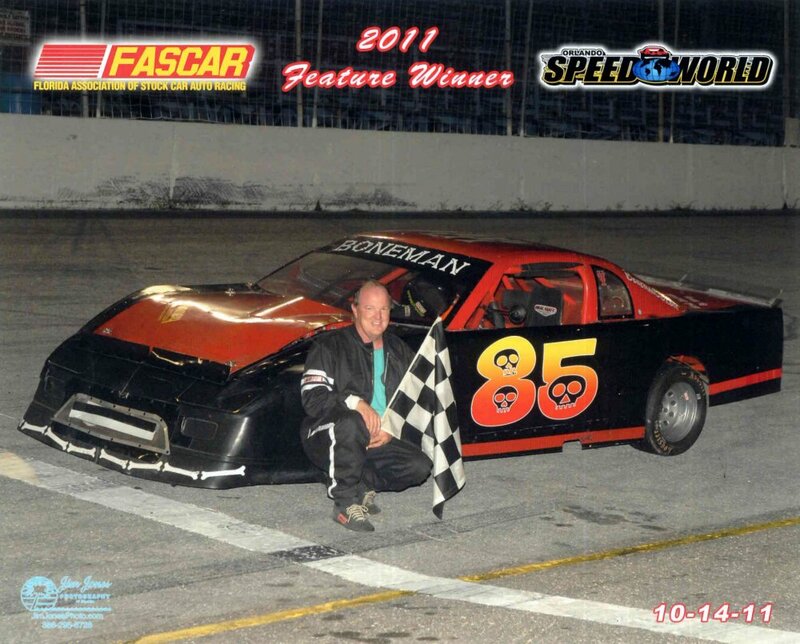 I had a flat tire on the pace lap of the feature and couldn't race the main event. Oh well, I'll be back in it ASAP. 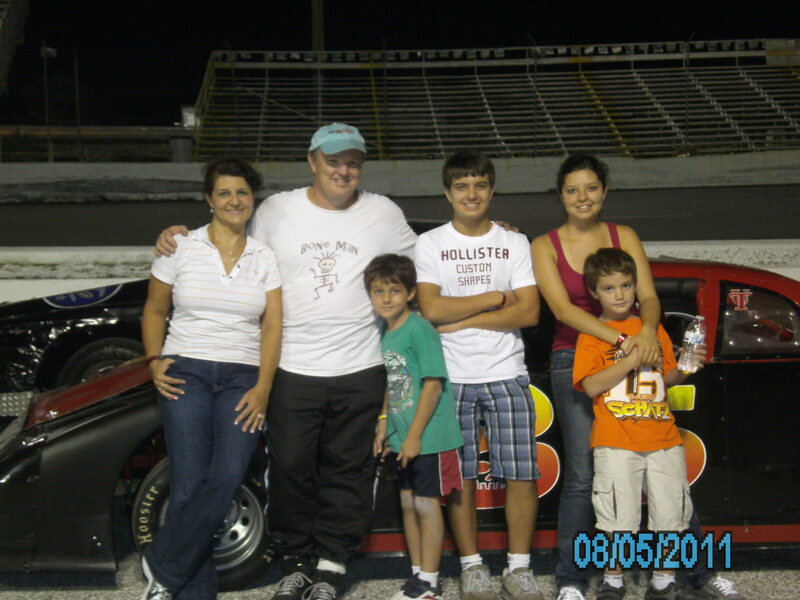 There was a brand new driver in my car for practice on 7-13-11. My wife's cousin was visiting from Mexico, and she gave it a shot for 15 laps or so. She did great and had a blast! Tonight we filmed the pilot for the proposed ?Tv series. It mixed cars from several classes, and went on until 3 in the morning, but I gotta say, that was just about the most fun I've ever had in racing. After many ups and downs, it came down to me and #21 modified. We were sent out for a 5 lap dual for the win. 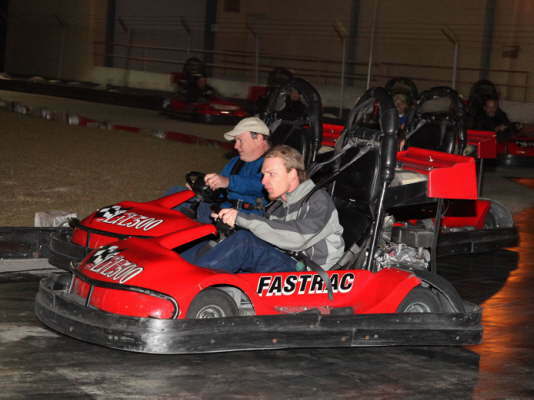 I ran wheel to wheel with 21 and we crossed the line inches apart. Then we found we were both DQ'd for breaking out! What a long, hot and crazy night. When worlds collide! 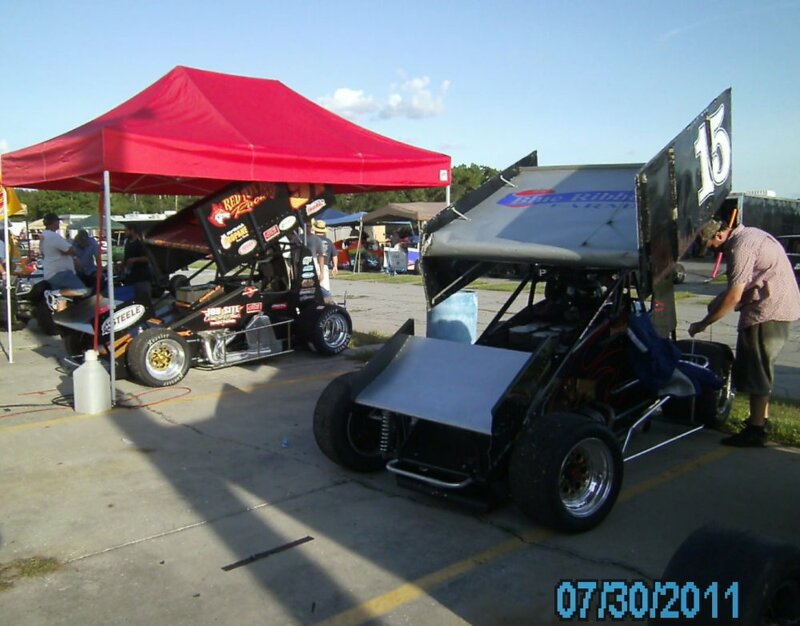 The Boneman parks next to sprint car legend David Steele. 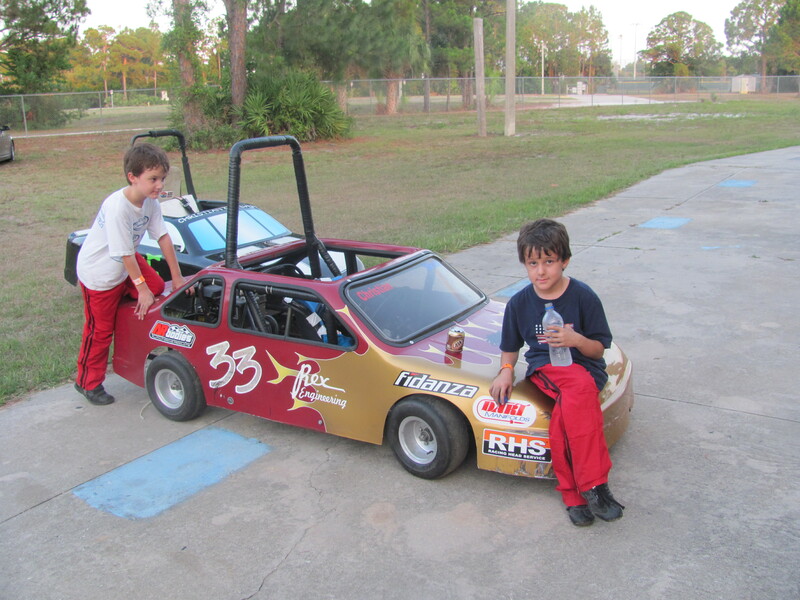 Steven and Christian were going to be my pit crew tonight with 85 strictly stock, but Speedworld rained out again. 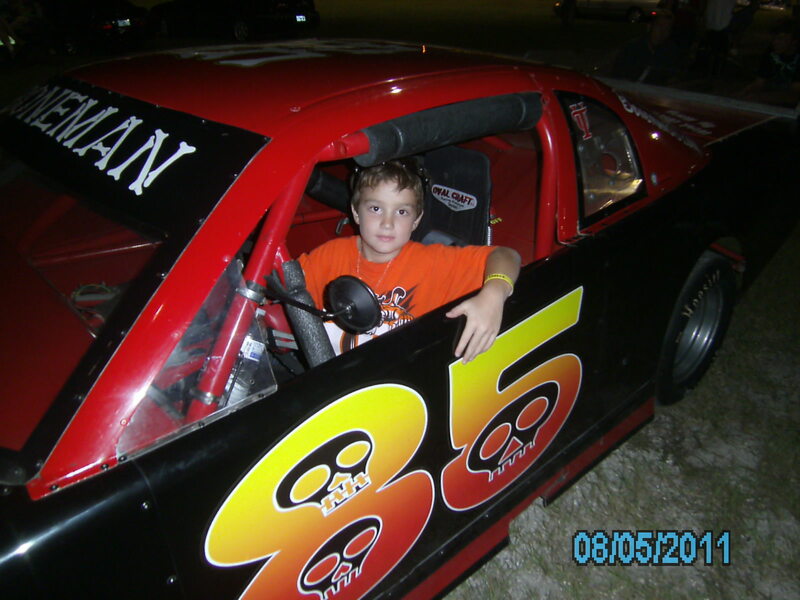 I was taking the mini stock to New Smyrna on Saturday, but that rained out too. 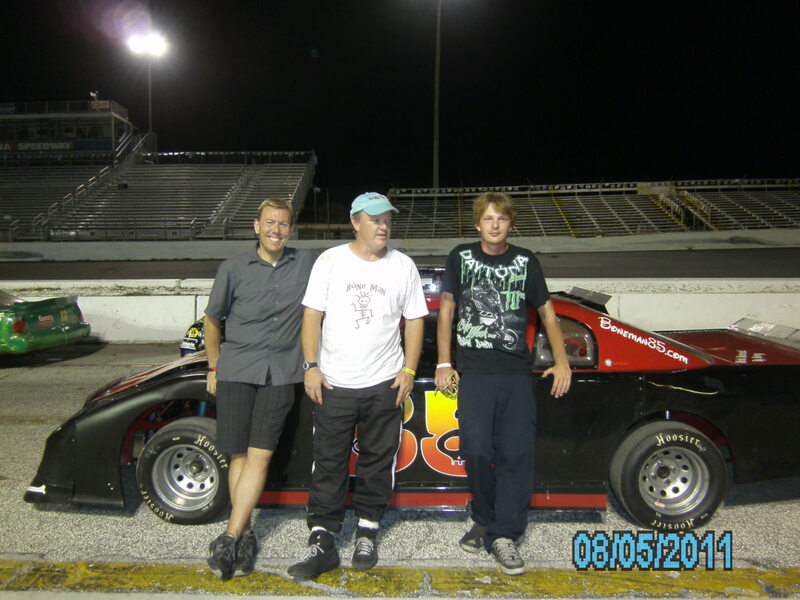 I ended up at Orlando Gran Prix with Michael Seay and Tim Walters. Fun! 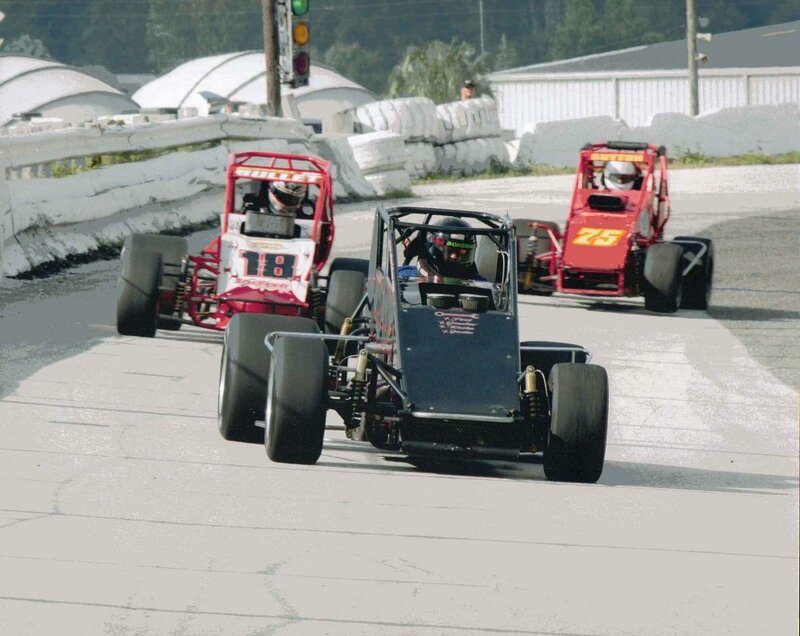 This was my first try at wingless sprints, and my first sprint race at Citrus County Speedway. Tonight was the IPSCA race, and I had such a good time! 15 ran great all night and I finished both the heat and feature. I ended up 13'th out of 18. Sprint car night! I was back at De Soto, but we fought fuel problems all night. 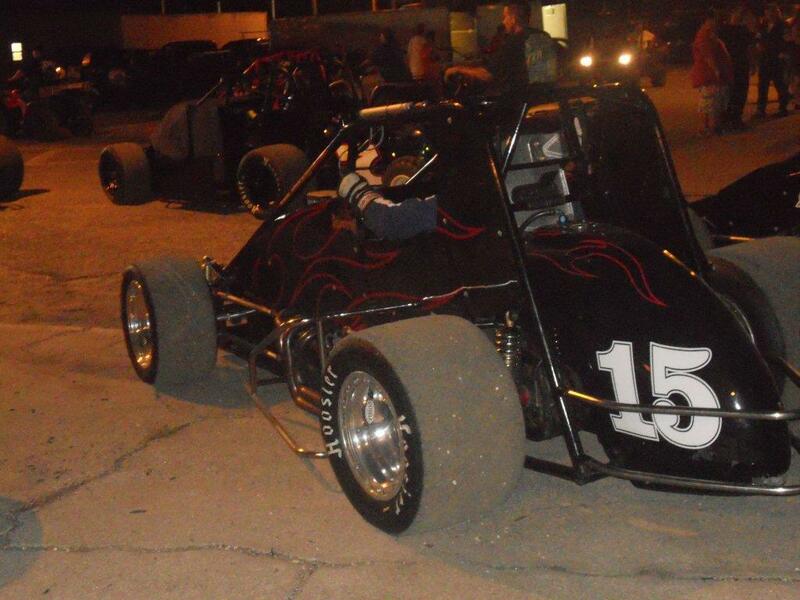 I didn't get to practice, but #15 was running well in the heat, and at the start of the feature. However, we had a long yellow flag and the fuel system loaded up again, so I pulled out. 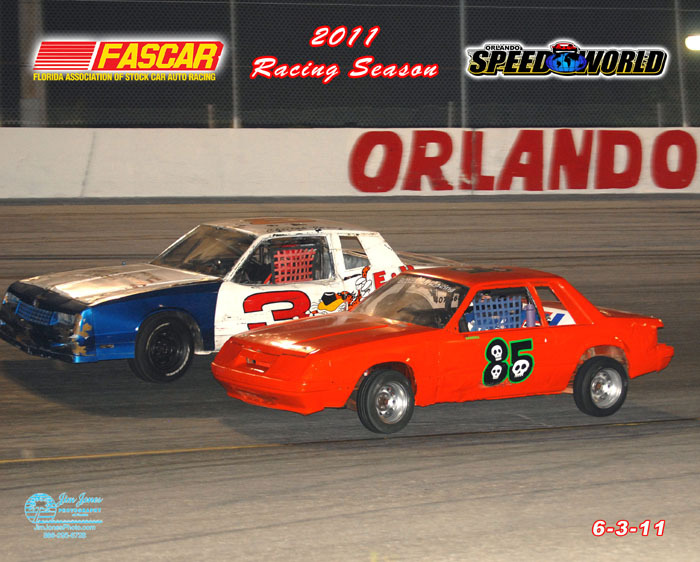 I was a few days from my 50'th B-day, so I tried something new tonight: two racecars on the same night. 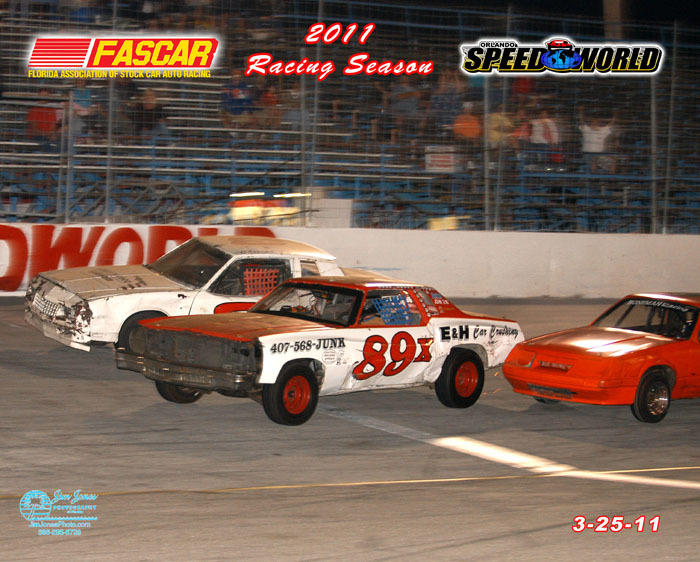 The show started off with the Strictly Stock feature. I ran ok, but couldn't get through traffic very well and I ended up 7'th. I jumped out of that and got into the mini stock (which was the very next race). I hadn't been out for months, but was running well. In the last lap I got a run on the leader and missed the win by a fender. Later on in the night, they had a Trophy Dash, which I won. 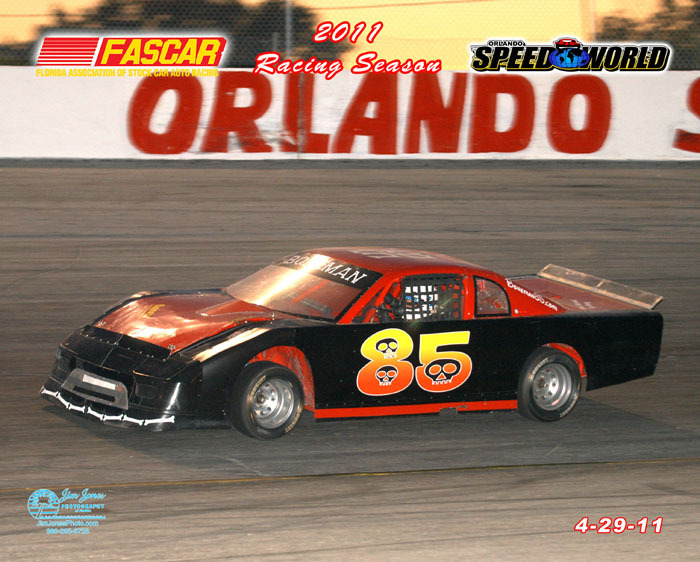 I got to the track late with the Strictly Stock. We had heavy race traffic which is good, but eventually I got wrecked intentionally, which is not good. It was only body damage, so I still finished. 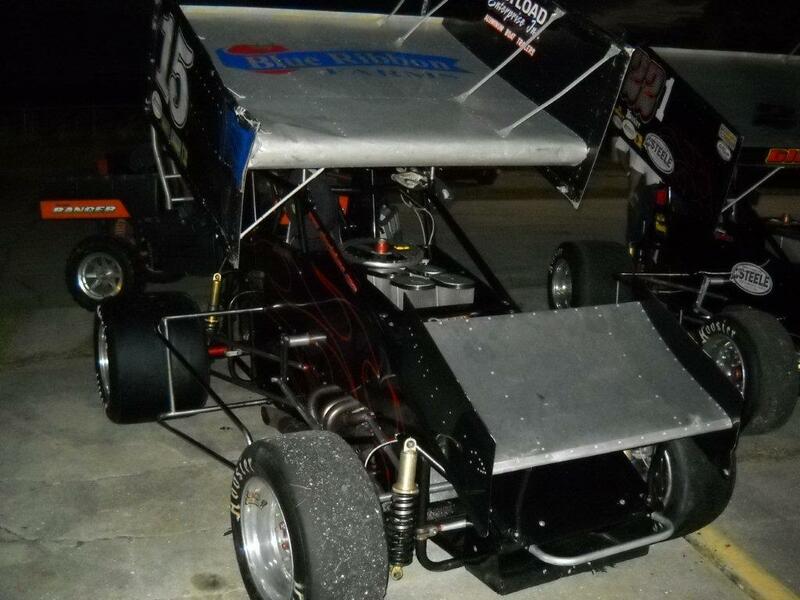 Back to De Soto Speedway and the sprint car! I finished the 30 lapper, and was 13'th out of 18. 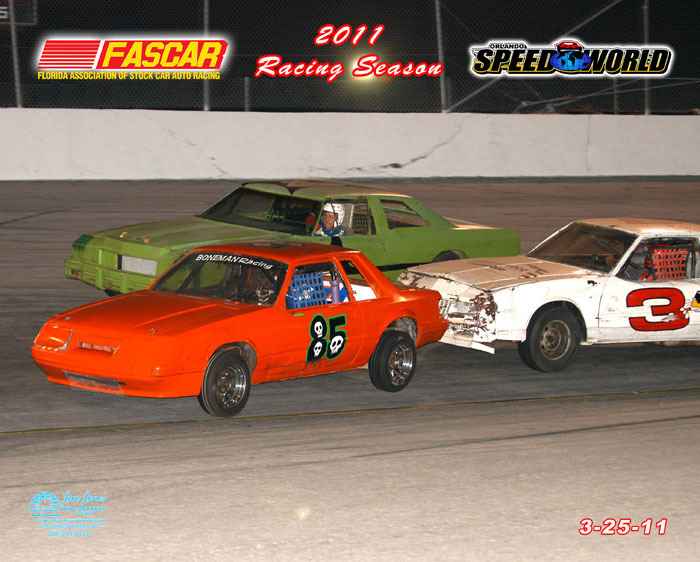 I raced New Smyrna on a Friday night. 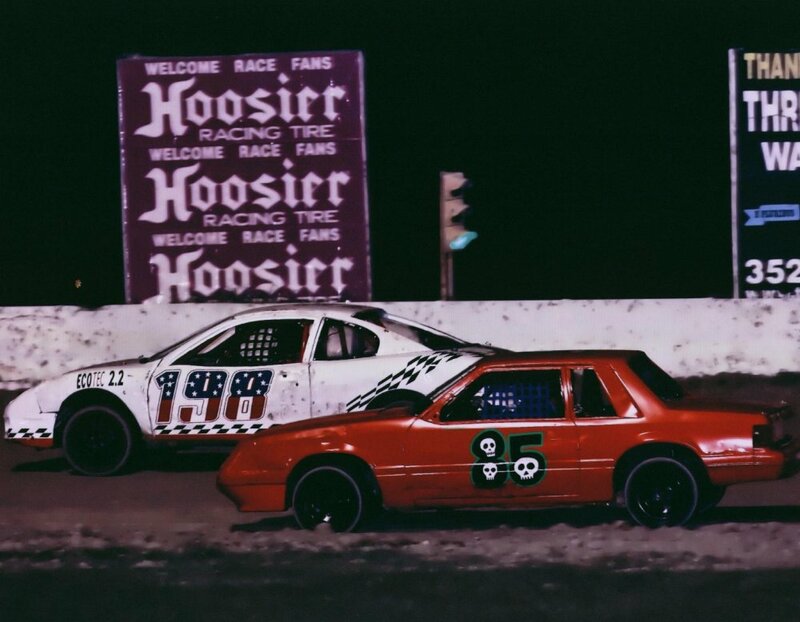 It was the opening of the two night Governor's Cup weekend. I started 11'th out of 15 or so, and got up to third. However, the throttle stuck on the car behind me, and he drove me into the turn 1 wall. Bummer! Otherwise my weekend was great! We had a tailgate party that started Friday afternoon, and ended around sun-up on Sunday. This was something different! 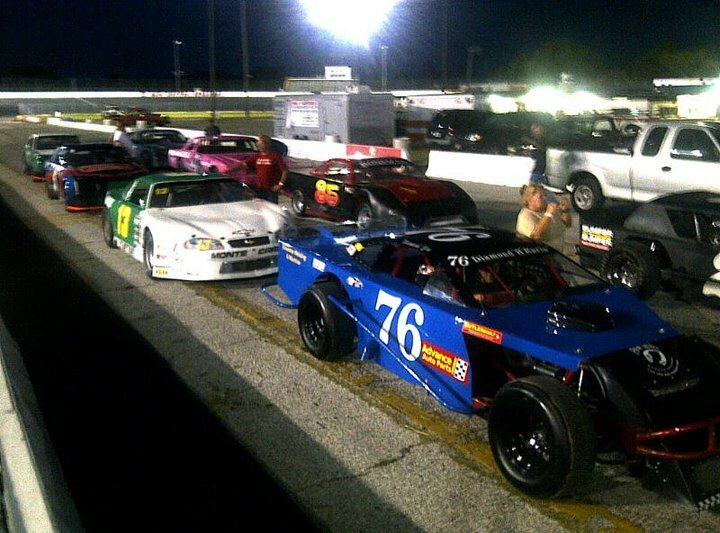 I borrowed #129 from my friend Tim, and ran the Pilgrim 100 at Hurricane Speedway. It started 28 karts on a 1/6 mile track, and I guarantee those 100 laps were the roughest that I've been in for years! We had a lot of yellow flags for wrecking and spinning. I managed to keep it together and finished somewhere in the middle. Here is my son Steven. He is on his way to his 7'th win in a row! There are some changes underway at the end of the year. 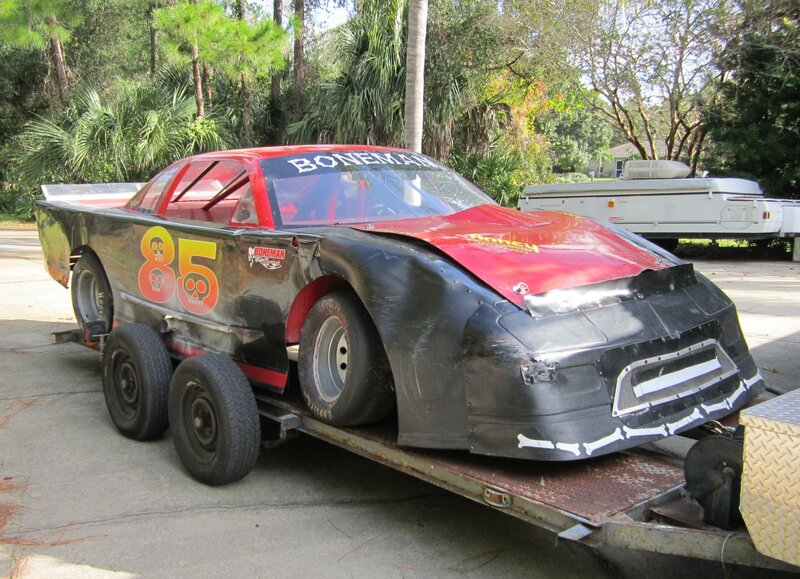 I've sold the black and red #85. After lots of fun seasons in mini stocks, I am in the process of cleaning all of the 4 cylinder stuff out the shop. 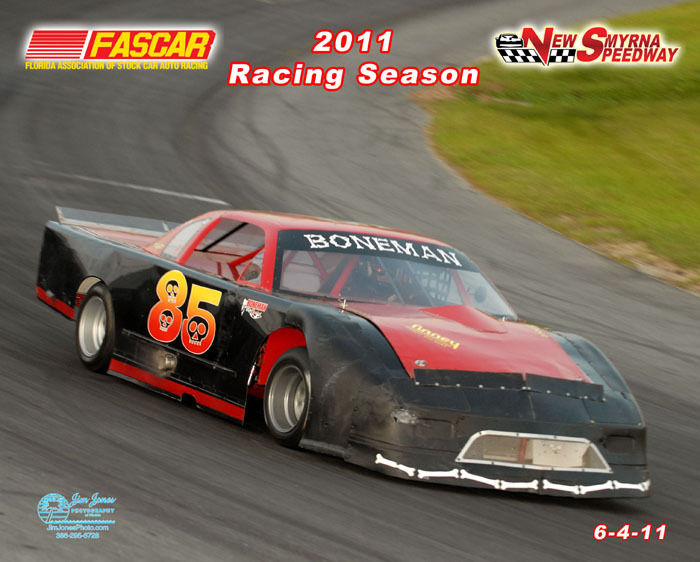 I'll be driving a sprint in 2012, and will be transitioning my own equipment into E modifieds. 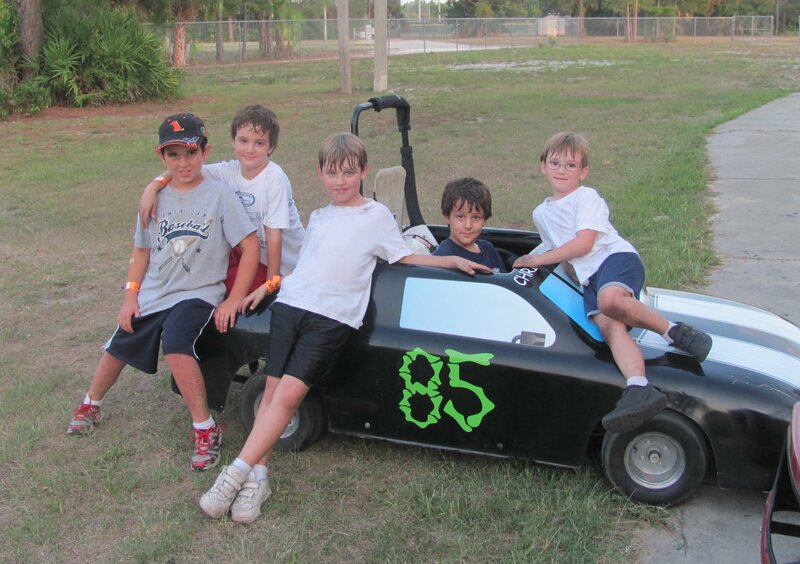 Christian and Steven will continue to race in 2012, and I expect that soon they will both advance into more modern racing karts. Its been a fun year! 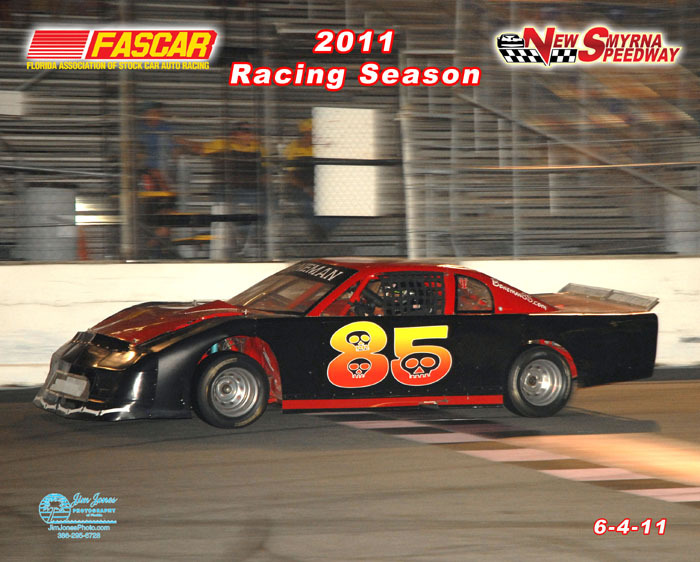 Can't wait to race in 2012!